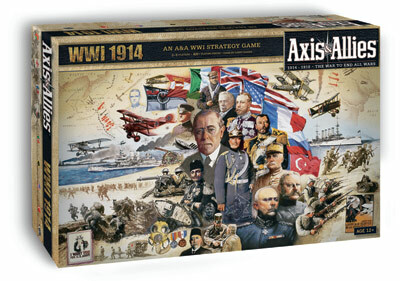 For the first time ever players can experience Axis & Allies in the setting of World War I. The familiar, time-tested A&A rules have been adapted to let players control the armies of 1914. Pick up this title to enjoy a classic favorite in a whole new way! New major powers, alliances, maps, and unit sculpts! WWI 1914 gives players command of the mighty armies of eight major powers. The Central Powers of Germany, the Austro-Hungarian Empire, and the Ottoman Empire are aligned against the great alliance of France, the British Empire, the Russian Empire, Italy and the United States on a new game board extending from Washington, DC to Bombay, India. 22 all-new unit sculpts are included, and enfranchised players will be pleased to see WWI units, like biplanes, in Axis & Allies for the first time.